We have been fishing and guiding the waters of Fiordland and Southland for the last 15 years. We are excited to offer our hosted group program to international anglers so that they can book their entire NZ fly fishing adventure with one operator and leave us to deal with the small details. Located in the South-western corner of New Zealand’s South Island, Fiordland is home to some of the country’s most wild and dramatic scenery. Fiordland is one of the largest National Parks in the world and a World Heritage area. The area is testament to the power of nature, here waterfalls tumble hundreds of yards into virgin forest and lonely fiords tower above the visitor. Many Moari legends pertain to the areas formation, it is said that the warrior demi-god Tuterakiwhanoa carved the rugged landscape from formless rock with a gigantic sword. As one looks around at the steep valley walls crowned by pointed mountaintops, it is easy to imagine. Fiordland comprises an enormous area, covered in rivers and lakes, almost all of which hold trout. Carefully chosen, our accommodation is based in the small town of Te Anau right in the heart of Fiordland and some of the best trout fishing on the planet. 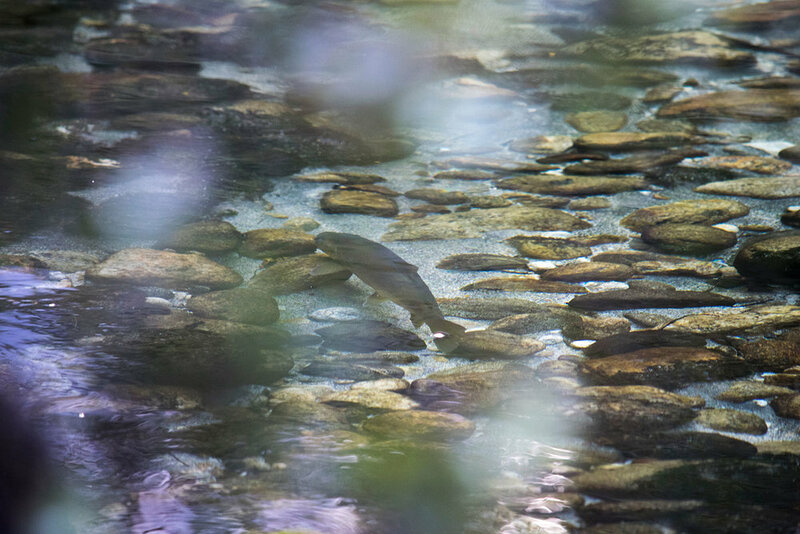 There are over 40 trout rivers within a 2 hour drive of Te Anau from large tail-waters to small springcreeks, and all of these become our playground during your hosted trip. Our guides are carefully selected and represent the very best fly fishing guides of the area. Nick Reygaert is the founder of Gin-Clear Travel. He has carved out a career as a celebrated fly fishing film maker for the last 15 years during which time he has travelled extensively in pursuit of the world's best fly fishing. He rates the NZ trout fishery as the most challenging and therefore rewarding fishery in the world. He has called NZ home since 2003 and lives very happily in the trout paradise of Te Anau with his wife and son. Chris Reygaert, brother of Nick, and an accomplished angler, surfer and snowboarder - the outdoors run in Chris's blood. His obsession began at an early age chasing bonito on the rock walls in Perth, Australia. Starting with bait then progressing to spin and finally, naturally, he found Fly Fishing. Chasing the dream, Chris moved to Tasmania where he honed his art on the wily brown trout of the Western Lakes. Numerous holidays to visit his brother in NZ also ensued until finally the calling of the world's best trout fishery was too powerful to resist. Working in the local fishing outfitting store in the off season keeps him on-the-pulse of the fishing scene, and there is very little fishing action that happens locally that Chris isn't privy to. Dedicated, professional and passionate - Chris is a perfect fit to guide you on your Fiordland adventure. LODGING DETAILS: Our accommodation is a luxury, fully furnished modern house, 4 bedrooms, close to the Te Anau township (very close to where the guides live) with spectacular views of Lake Te Anau and the Fiordland mountains. Guests will have their own bedroom, bedding and linen is provided. A full turn-down house keeping service is provided & towels and clothes are washed daily. FOOD & BEVERAGE: A continental breakfast will be served at 0730h every morning in the kitchen of the accommodation by the chef. Lunch is carried by the guides and is provided on the river. It consists of fresh sandwiches, fruit, museli bars and biscuits. Our evening menu will consist of Kiwi-classic dishes prepared by our chef; BBQ, Fish and Chips, Shepard's Pie, Chicken Caserole etc. Sea fish, Crayfish and venison (all caught or hunted by Chris & Nick) will be featured in the meals. Special attention will be given to the desert course and our guests can expect a mix of European classics and Kiwi favourites. LENGTH OF STAY: The typical hosted package at Fly Fishing Fiordland is six (6) days of fishing, however, we can tailor a package to suit your needs. NON-ANGLING ACTIVITIES: Fly Fishing Fiordland is a fishing-focused operation. However, with that said, it is a relaxed atmosphere and culturally authentic experience. Non-fishing partners can enjoy a host of different activities including walking, tramping and sight seeing. INTERNET/COMMUNICATION: Cell phone reception is very good in the town and unlimited internet is provide at the accommodation. 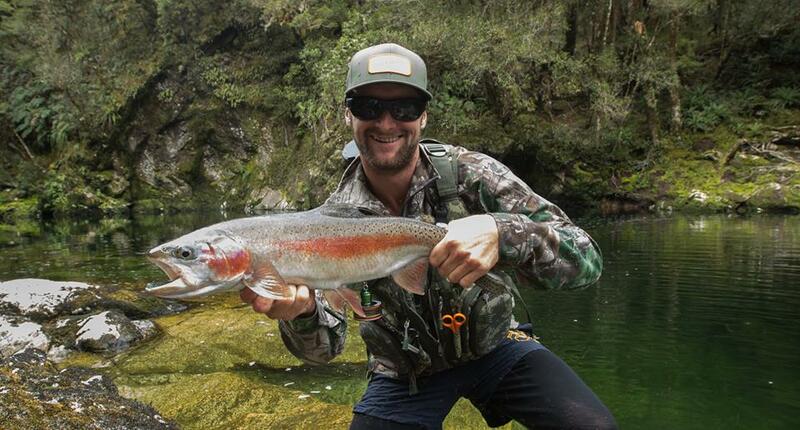 GENERAL INFO: New Zealand is widely considered to be the best sight fishery for trout in the world. The Fiordland/Southland region is home to more rivers and streams than any other province in New Zealand. Blessed with an abundance of productive spring creeks, freestone rivers, rain fed streams and lakes of many sizes, coupled with the incredible Fiordland scenery and crystal clear water this is a fly fishing paradise. While many of our rivers do not support the sheer numbers of fish found in many American waters, the opportunity to spot and stalk individual trout more than compensates for quantity. The skilful sight fishing and 'match the hatch' techniques required to catch these fish draw much international interest , and many anglers visit in search of the ultimate fly-fishing experience. This is hunting; we stalk, locate and cast to trout in their natural environment, where stealth and presentation mean everything. Many of these trout are large – a 6-pound (circa 24-inch) trout will fail to raise the eyebrows of the locals – although the average size of the trout that we encounter at around 3 pound (18inches). However this fishery is also recognised as one of the most technical; very long leaders (sometimes 18ft+), big or heavy flies, spooky fish and strong wind are all factors that make the fishing here challenging. JET BOAT FISHING: The ultimate kiwi adventure aboard this custom-built jet boat piloted by a friendly local fishing guide. The Upper Waiau River has some of the highest counts of trout per kilometre in the whole of country, making it one of NZ's most productive fisheries. Fishing with the jet boat will allow you to access remote parts of this fantastic river. But it’s not just the thrill of catching trout that makes this such a memorable day. The scenery is truly epic - think Lord of the Rings - with the wilderness of Fiordland National Park as a backdrop. Clients get to enjoy a hearty Riverside BBQ lunch with local produce such as Fiordland Crayfish. This is kiwi hospitality at it’s best. HELI FISHING: As an optional add-on; go remote, into waters rarely fished by the majority of anglers with a Heli Fishing Adventure. Heli fishing isn't necessarily about finding larger trout, or bigger numbers of fish. It is all about getting into truly remote waters and experiencing the challenge of deceiving wild brown and rainbow trout in the breathtaking surrounds of inaccessible mountain valleys and gin clear waters. Price varies with flight duration and a quote can be arranged on application. EQUIPMENT REQUIRED: We recommend a #6 weight rod for fly fishing in Fiordland, preferably one with a fast action that can deal with heavy flies and strong winds. Floating lines are the most commonly used, those with short heads are the best for cutting through the wind. Most clients are happy to bring there own rods/reels/waders etc. Wet wading is common practice in New Zealand through the majority of the summer season from Nov-March. If bringing your own waders and boots please remember that New Zealand has a No Felt Sole policy, all fishing gear you bring must be declared through customs. DISCLAIMER: We cannot control the weather. It is very rare for us to cancel a day due to inclement weather, and we pride ourselves on our knowledge of our waters, and a variety of cutting edge techniques to give you the best opportunities on the day. Fishing in New Zealand can take anglers into some of the world's most wild and isolated terrain, and while we endeavour to provide a professional and experienced service, we accept no liability for any injuries, medical conditions, losses or claims of any kind or nature. We advise all international travellers to hold travel insurance. International clients must fly either to Auckland or Christchurch and then onto Queenstown. ARRIVAL & DEPARTURE DETAILS: Fly Fishing Fiordland staff will meet your group at the Queenstown Airport and transfer you to your accommodation in the town of Te Anau (2 hour drive). On the finally day you will depart Te Anau in the morning and dropped off at the Queentown Airport for your flight home. WHAT'S INCLUDED: • Transfers from Queenstown Airport, lodging in private rooms, Beer and wine and non alcoholic beverages, Breakfast, lunch and dinner, professional fly fishing guide (1 guide per 2 anglers), flies, 2 days x jet boat fishing. WHAT'S NOT INCLUDED: International airfare to Queenstown Airport, Hotels and meals in transit, Personal equipment, all fishing gear and tackle, fishing license, Gratuities for guides and staff. SAFETY: Our guides carry a cellular phone, a 406 MHZ Personal Locator Beacon registered with Maritime NZ and a Satellite comminication device to ensure that if help is required, fast, efficient assistance is close to hand. We operate under a professional Safety and Risk Management plan as documented by the New Zealand Professional Fishing Guides Assn and approved by Occupational Health and Safety NZ (OSH).